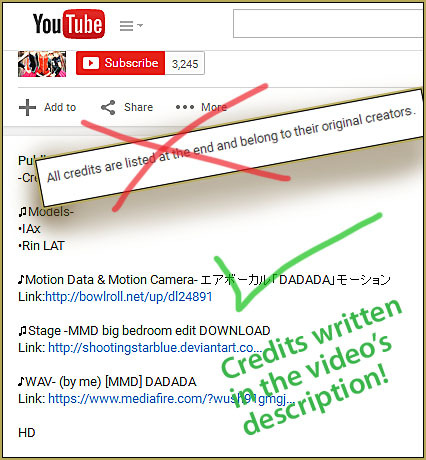 Why should I have written credits in my MMD video’s description? 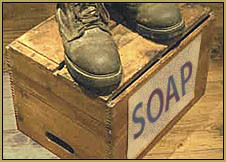 … I have them in my video. Put credits in the Description of your video! I am on a one-man mission, now, to get MMDers to list their credits in the written description on YouTube… the only “Thanks!” we MMDers get is the Credit associated with the video… and when an MMDer only flashes the credits at the end of the “film”… as if it were a “real movie”… it is not searchable… … I, as one of the “creators,” like to search YouTube for mentions of my stuff… our stage, my “wooden table”, my “wooden stool”… my “Reggie’s Evil Eye Effect” … … and I will never find the videos actually using my stuff when the credits are included in the video but not in the written description on YouTube. Also, I often search YouTube for an example of an effect… like I was looking for someone using “Beamman’s KiraKira Effect”… I won’t find it if the credit is not listed in the video’s description… the search engine cannot watch what’s written in the video… it needs to search written words. So… Please… that nice paragraph of credits in that final scene of your video… help-out MMDers across the planet… please add those credits into the written description for that video on YouTube where we could find it if we search for it.